Nowhere else in the US is the Hispano/Latino landscape so animated and historic than it is in West Las Vegas, New Mexico. In 1835 Mexican settlers established this community through a land grant from the Mexican government. Most of the early Spanish and Mexican settlements in the American southwest have been wiped out, absorbed into the “American” urban fabric, or transformed into a museum. Not so in West Las Vegas: the original infrastructure - community-operated ditches or acequias, street grid, and central plaza that is the center of civic, cultural, and social life - was organized in accordance with the planning principles of the Spanish, “Law of the Indies.” Today, they are still intact! 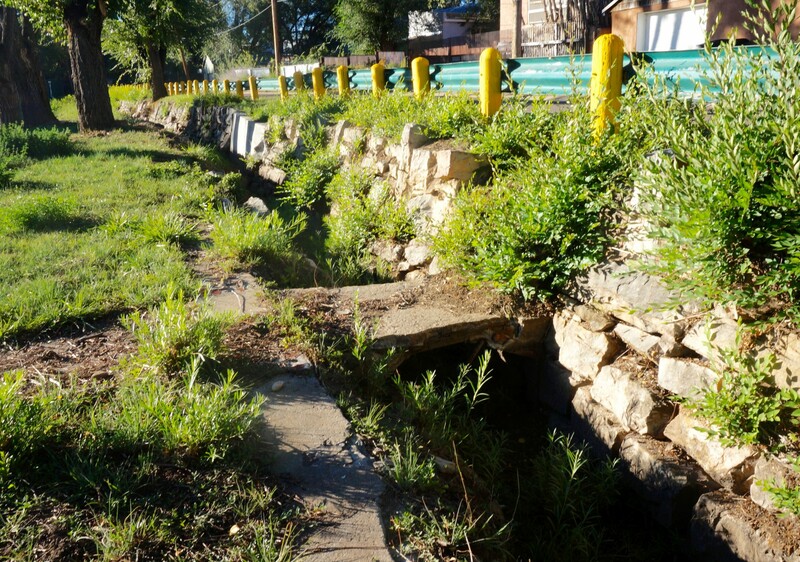 The asequia, a community-operated irrigation ditch, in Las Vegas, NM. That being said, the beauty of West Las Vegas lies in the residential landscapes of Hispano homes around the plaza. Many of the original plots of land and adobe structures have been inhabited by the same families for generations. On these residential lots, 100-year old adobe homes can be found side by side with trailer homes. Hispano local knowledge, materials, and indigenous traditions for building and living offered cultural, economic, and environmental solutions to people’s needs as they customized and personalized their homes and neighborhoods. The changes Hispanos make to their homes and landscape, are purposeful and representative of the struggles, triumphs, habits, and beliefs of these residents. In the West Las Vegas community, social life and family life are closely linked. The social connections are interwoven and reinforced by the manipulation of the physical landscape. The Hispano household extends their presence to all four corners of the lot, creating an extroverted setting that is both decorative and multi-use. In this way, each Hispano single-family house "communicates" with others who share a common cultural understanding expressed through the built environment. For example, residents communicate with each other by personalizing their front yards. By consistently building fences, they create a bond which binds together the adjacent homes to form a mini street wall. By adding and enlarging front porches, they extend the household out into the front yard and create a physical change that is re-enforced by social connections. Such residential environments, highlight the use of public and private space; both indoors and outdoors. 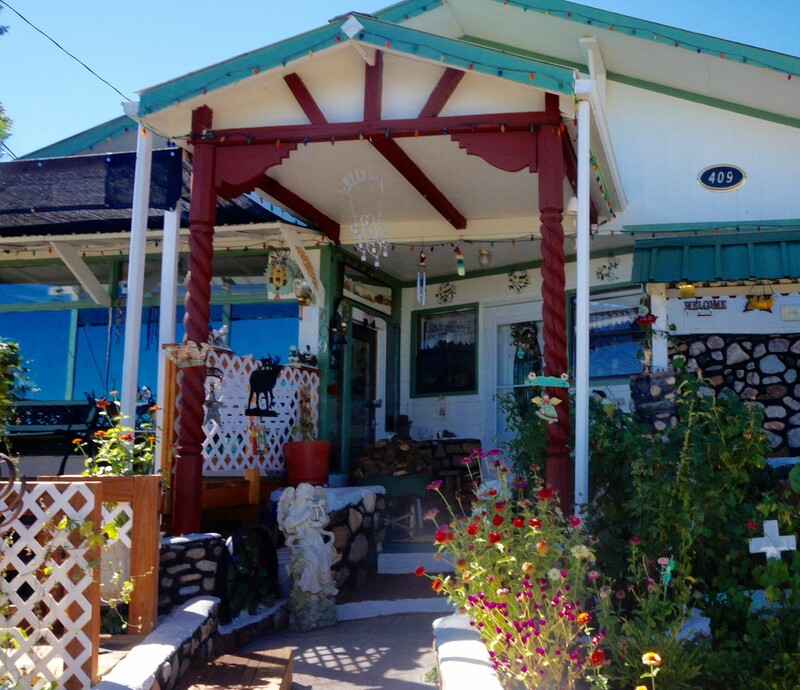 Almost every West Las Vegas home has an open-air front porch of differing size and shape. These porches can be found on the original adobes to contemporary houses. The Hispano front porches fuse together the indoor and outdoor spaces that reflect the warm Southwest climate. 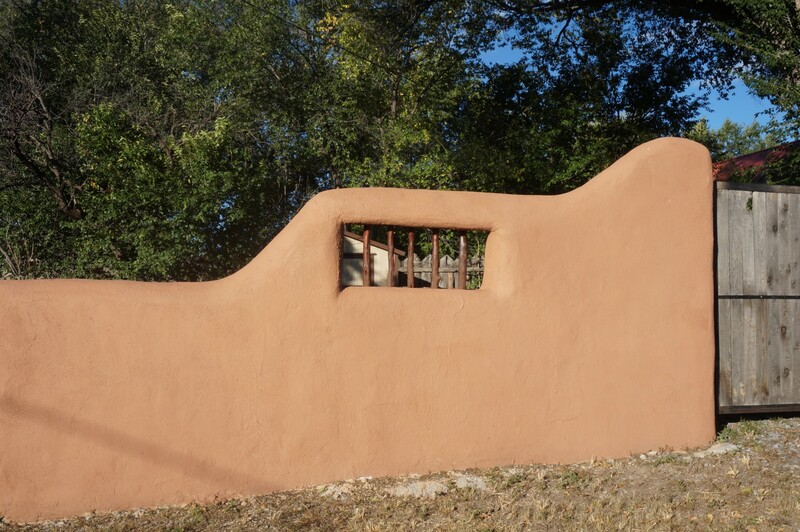 The use of thick adobe walls cool off the homes from the summer heat; the cooling effect is then augmented by the shade from the numerous front porches. A colorful and decorative front porch scene in West Las Vegas. The front porch is a critical buffer between conventionally oppositional spaces. The sofas and chairs placed on numerous front porches in West Las Vegas indicate that the porch is a space of socializing with family, friends, and neighbors, actively blurring the line between outdoor-indoor and public-private spaces. The porch is often designed and decorated to reflect personal taste and uses. Many times elderly residents will fill the porch with potted plants, small statues, and birds in cages. While others put out toys and religious icons like images of the Lady of Guadalupe and seasonal decorations. Stucco, stone, brick, wood, and wrought iron are used in to create historic shapes like arches and railings. The front porch design fuses both beauty and utility because this is where the famous New Mexican chilis are hung in bunches off porch beams, left in the sun to dry. Through varying degrees of resources, creativity, and design interventions the Hispano front porch is a cultural references point composed with a particular aesthetic, that highlights local craft and materials. In many cases, the front porch is the most prominently spatial element of the home and becomes their public face. The front porch is where Hispanos become civic and bond with their neighbors through use and design. An example of front porch in Las Vegas acting as a buffer and a connector. Almost every home in West Las Vegas has a front yard fence. The egalitarian nature of the front yard of American suburban culture has led many people to think of fences entirely in terms of exclusion, seclusion, or security - a barrier against the world. The American suburban house uses this visible expanse of land as a psychological barrier that separates the private space of the home from the public space of the street. People do not walk on the grass of another person's front lawn unless they are invited or are children and pets. A fence in West Las Vegas that establishes the resident's space and leaves room for the neighbor/pedestrian interaction. In the Hispano neighborhood, however, fences are a social catalyst that bring neighbors and pedestrians together for social interaction. For Hispanos, front yard fences tend to represent stability of the homeowner at that location. This 3-4 foot fences are a usable space of social interaction. These fences can be made from tree branches, stones, adobe, chain link, wrought iron, or all of the above. Fences create easily defendable spaces and illustrate a simple, straightforward approach to possession: "This is my space." Borders bring people together and front yard fences define boundaries between neighbors and public and private space. In Spanish there is a saying "through respect their can be peace". Respect for the individuality of each resident is reinforced in the use of fences which clearly delineate property ownership. Thus, the residents can personalize their front yard without physically interfering with the neighbors. This fence acts to extend the private space of the home, thereby becoming an active part of the household. 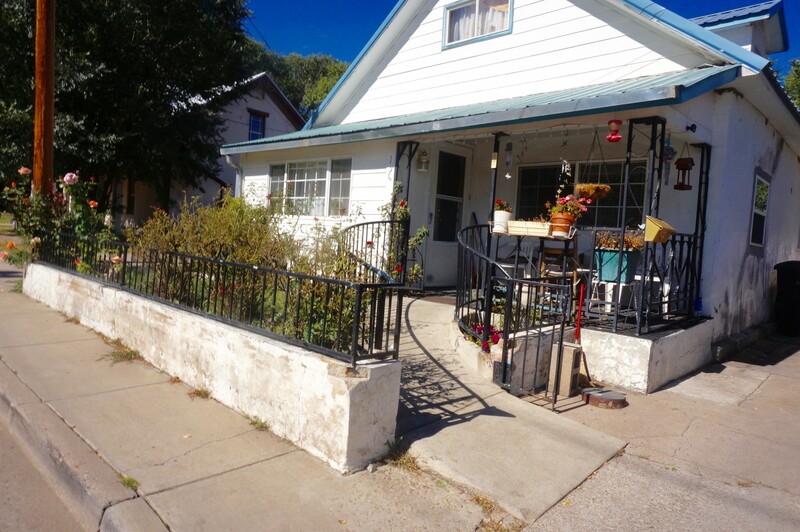 Amongst Hispanos, front yard fences promote social interaction through the ways in which they are physically used. The fences break down the social and physical barriers by creating an edge, where people tend to congregate to socialize, create a pop-up garage/tag sale, or hang seasonal decorations. The use of fences in the front yard changes the approach to one’s home and moves the threshold from the front door to the front gate. The enclosed front yard physically defines a barrier between the public and private spaces of the home in relation to the street. The enclosed front yard of Hispano homes acts as a large foyer, and becomes an active part of the household. The sense of entry into the Hispano home begins at the front gate. As a result, the front gate becomes the threshold emphasized with added decoration, like masonry and wrought-iron, conveying social and cultural meaning. Visitors rarely cross the threshold of a home unless invited to do so. And an invitation to enter, or lack thereof, is a clear signal of the occupant's desire for more or less social contact. One can keep visitors 'at bay' by not inviting them to cross the threshold, and this is a powerful device in American society to regulate social engagement. Fences can be used to communicate an invitation or a desire for privacy or something in between, as demonstrated above. The enclosed front yard becomes a large "defendable" threshold in Hispano homes, which actually, allows for more social interaction to take place between the residents and pedestrians. Individually, the fences along the street break up the lawn space of each home. 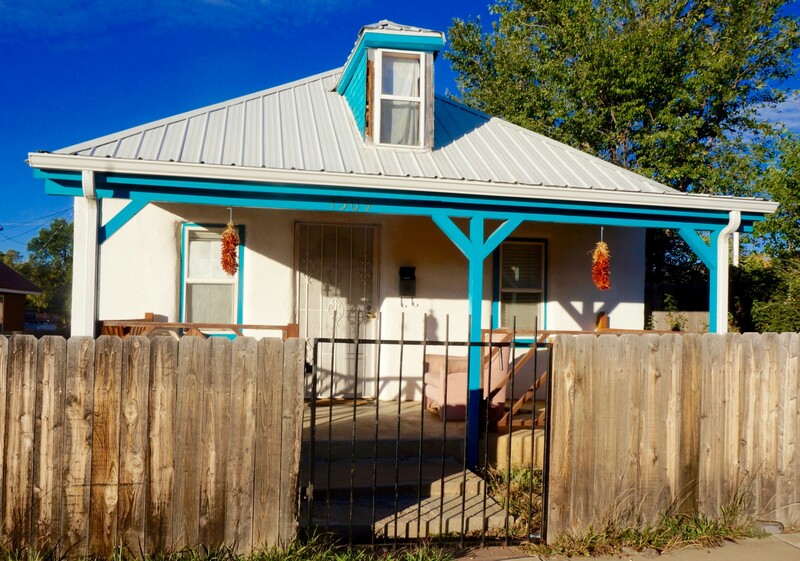 But, collectively, the enclosed front yards in the neighborhoods of Hispano communities create a very intimate atmosphere in contrast to the non-enclosed front yards of typical suburbs. As a result, the street becomes more urban, rather than suburban, in character as the fences externally reflect the personalities of the residents from the sidewalk. The social interaction one experiences in the enclosed front yard is not as demanding and intimate as being inside a house. Since this space is public, the interaction is very casual, like being in a European cafe where one can stare off for a few seconds and not offend their companions. 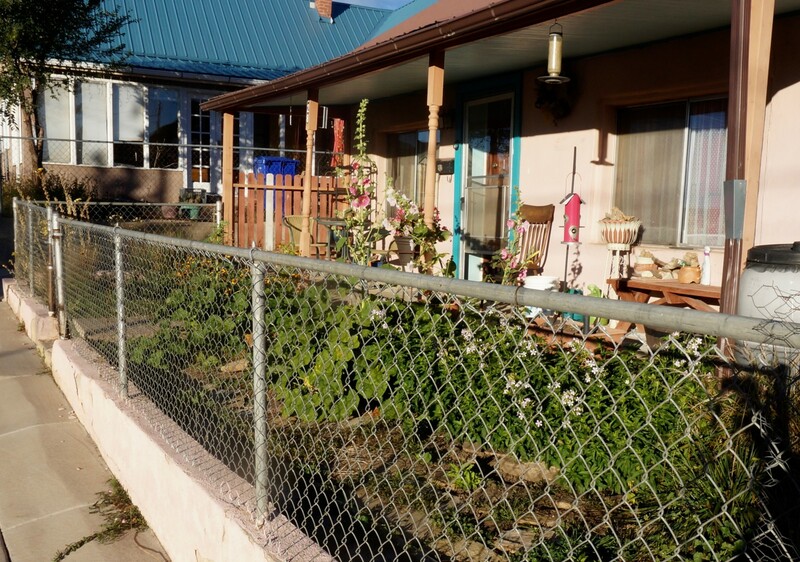 The collective of fences along the streets of West Las Vegas create a space that functions like a small town plaza, where every resident can participate in the public space of the avenue from a private space in their front yard through the front yard fence. Nowhere else in the Hispano landscape is space so illuminated and celebrated than in the enclosed front yard or plaza. While many of the older adobes were built up to the street with small front yards, later homes were built in the middle of the lot with front yards. The intimate scale of the enclosed front yards provides a contrast and refuge from the auto-centric scale of the street. 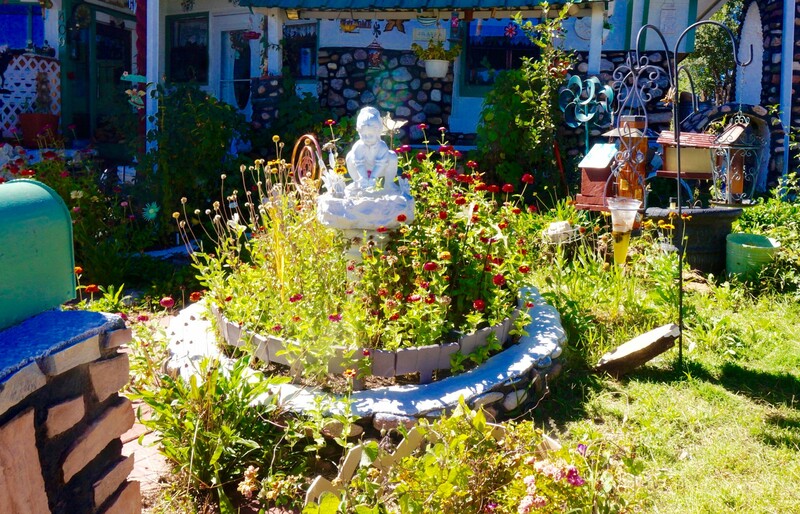 This front yard scene tells a story and demonstrates how this space can be used for self-expression. 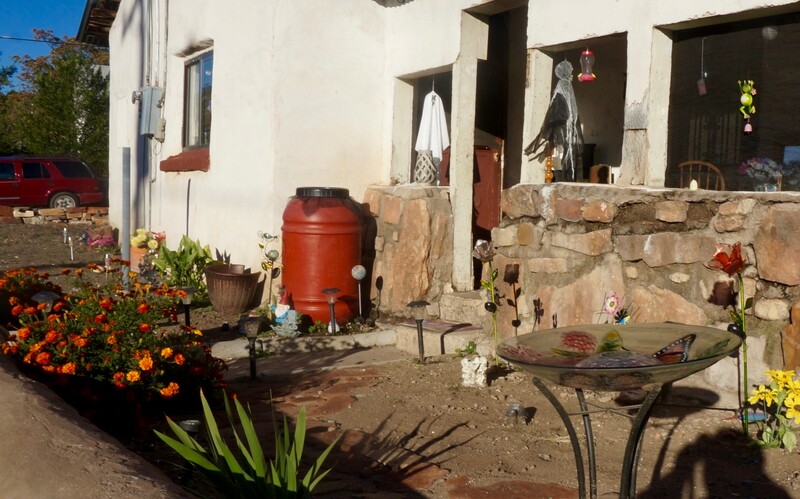 Hispano front yards became a space for individual and cultural identity depending on the practical needs of the owners. Front yards might look cluttered from the street but from closer inspections the use and design of the front yard vary from elaborate courtyard gardens to working spaces. The enclosed front yard acts like a room without a ceiling because of the semi-privacy and sense of security. These personalized front yards and the fences enclosing them, have been design to reflect the residents' behavior patterns and have altered the physical characteristics of their neighborhoods. The green continuous park-like setting that symbolizes the American front yard in the suburbs, has been cut up into individual slices in West Las Vegas. These "slices" create diversity, and allow individuality and sociability to take place seamlessly. Another example of a colorful exterior space that is personalized and connects with the outside environment. The American front yard is a space dedicated to showing that we are good and responsible members of the community measured by how well the household maintains their front yard, and by proxy the order of the neighborhood. In West Las Vegas, the community identity of the neighborhood is not measured by the collective understanding of the front yard, but rather the collective understanding of the individuality of each resident. Acceptance by the community is not based on appearance of the front yard but through physical and social contact with the neighbors. The front yards of West Las Vegas are not anonymous spaces but are personal vignettes of the owner's life. For more than one hundred years, Hispano West Las Vegas has co-existed side by side with the modern, Americanized Las Vegas. However, while Las Vegas’ Victorian architecture and grid iron street network reflect the notion of “Victorian perfection,” the houses, porches, fences, and front yards of West Las Vegas reflect a deeply rooted, culturally indigenous design vocabulary, which enables its community members to simultaneously express their individuality and their connectedness. The homes and residential lots have evolved organically and continue to evolve to express the memories, needs, and aspirations of the residents. This blog post was originally published on the CIRD website.